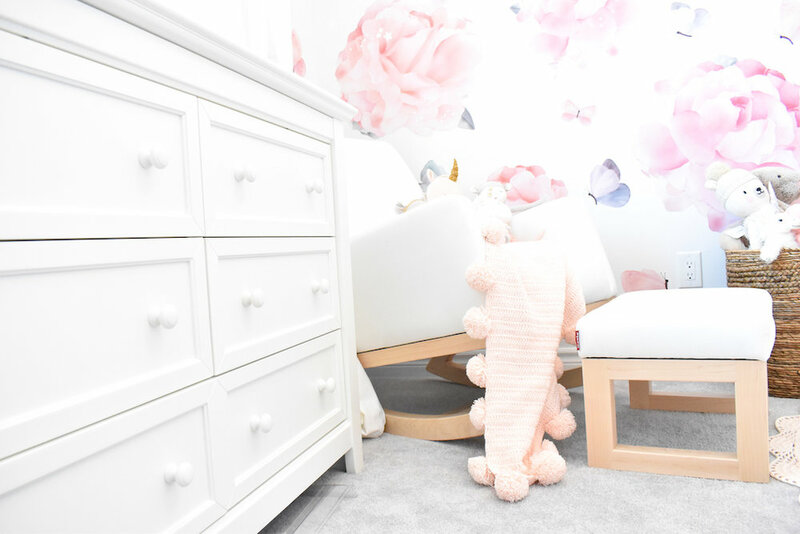 Melia's Baby Girl Dreamland Nursery Reveal! After six months of preparation and getting all the final details together, I am now ready to reveal to you Melia’s Nursery! It took me a while to put it all together, because for a long time I was unsure of the theme I wanted to go with. I would spend hours on Instagram and Google, searching for Baby Girl Nursery Ideas and I just couldn’t decide what direction I wanted to go with. So I thought to myself, instead of a “theme”, what if I start just piecing together a dreamland for her. I wanted to create a room with soft pinks and whites, but with lots of colourful and attractive designs and toys. Something that was soothing, but also would stimulate her mind and her creativity. And I am so happy to share with you all the details of her room that made it all come together! Ta-da! So at first, I of course started with her crib and dresser. I actually got these when I was still only about four months pregnant with her. At that time, I was (like I mentioned) unsure of the theme, but I did know that I definitely wanted her furniture to be white. I did a lot of research and I wanted to choose a crib that was safe, and that could adjust to the different stages of Melia’s childhood. I fell in love with the Baby Relax Senna 3-in-1 Upholstered Crib in white, with its soft and fresh upholstered side panels, and the matching Baby Relax Tia 6-Drawer Dresser in white, with its decorative molding and framed front drawers. Her mattress was also top priority on my list. I wanted to really make sure I got her the best one possible. Safety and comfort were my main concerns when searching for the right mattress for baby Melia. I went with the Aerosleep Mattress and highly recommend it! It has a unique and strong honeycomb structure, that has a layer of air in between it that cannot be compressed, therefore Melia’s has plenty of breathing space while she sleeps. There are so many benefits to this amazing mattress, and I suggest reading all about it on their website. I am sure you will fall in love too! For drapes and bedding, I went with Carousel Design. I read so many amazing reviews, so I decided to take a chance and went with them. I loved being able to custom design every little detail that went into her bedding and drapes. I was able to use their website and literally design my own bedding combination, including the bumper, skirt, sheets, and blanket. I was even able to order samples of different fabrics to see what I liked best. I had a lot of fun playing with the different colours and patterns, and I was leaning towards doing everything pink, but ultimately choose to make everything fresh and white! Also, I choose to get black out drapes for her window. Then I moved on to search for the perfect glider. I was planning to breastfeed, and so many of my friends told me how comfortable and relaxing it is for a baby, when you hold them in your arms and softly rock back and fourth in a glider, so I knew I wanted to find one that was perfect for her room! I came across the Monte Design Joya Nursery Rocking Chair. What I loved about Monte Design, is that you can actually design your own chairs! You pick the frame, and can choose the fabric, the colour, the base, and even the pillow! I went with a white Microsuede fabric, with a clear maple base, and pink pillow. The only thing I would have done differently if I could, was choose a white Enviroleather fabric instead of the Microsuede. Just because I find the suede gets dirty very quickly, especially since its white! So if you are going to order your chair in white, I would suggest choose an Enviroleather fabric! But all in all, the chair is absolutely stunning, and Melia loves it! Do you have any tips on how to keep the Microsuede fabric clean? 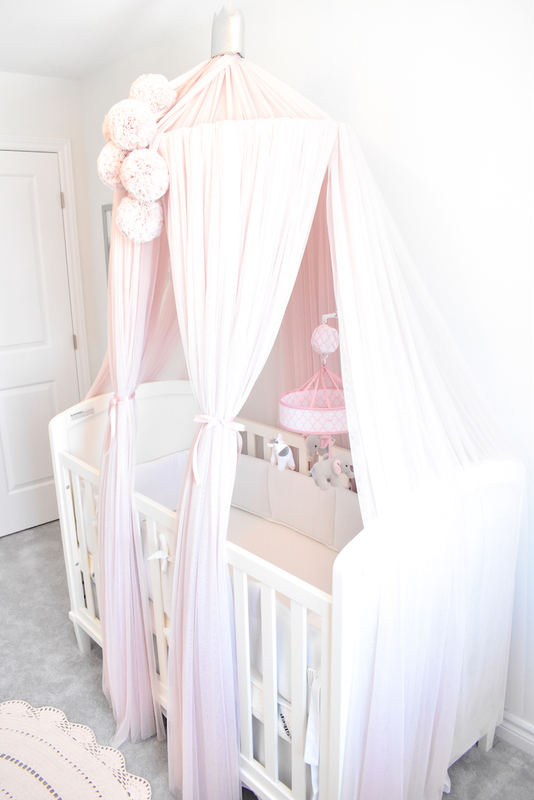 I wanted to hang a gorgeous canopy over her crib, and literally looked everywhere to find the perfect one! When I came across this one, I fell in love right away! 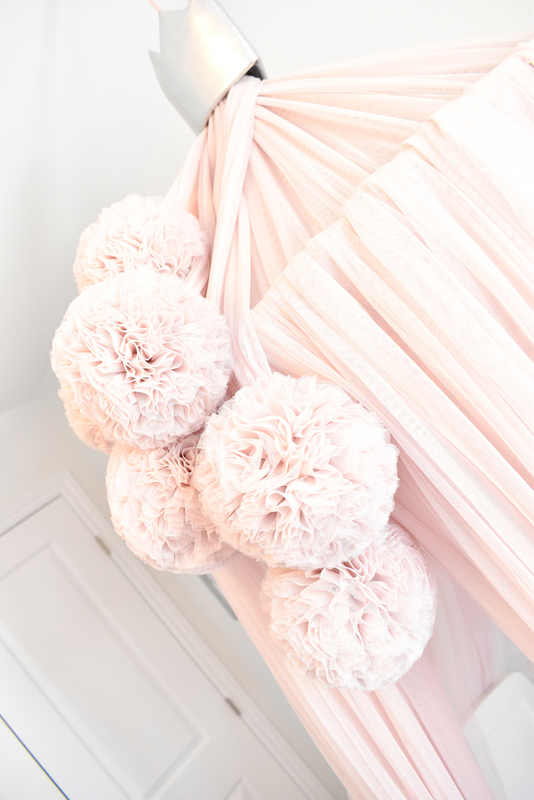 I went with the Spinkie Canopy, and Spinkie Pom Garland in Pale Rose. Its absolutely stunning in person, and the quality is amazing. I really could not be happier. Nothing but the best for my princess! For her rug and blankets, I got some adorable handmade crochet pieces from The Little Panda Shop. I even got her a super cute handmade sweater, which you can see Melia wearing here. What an art! 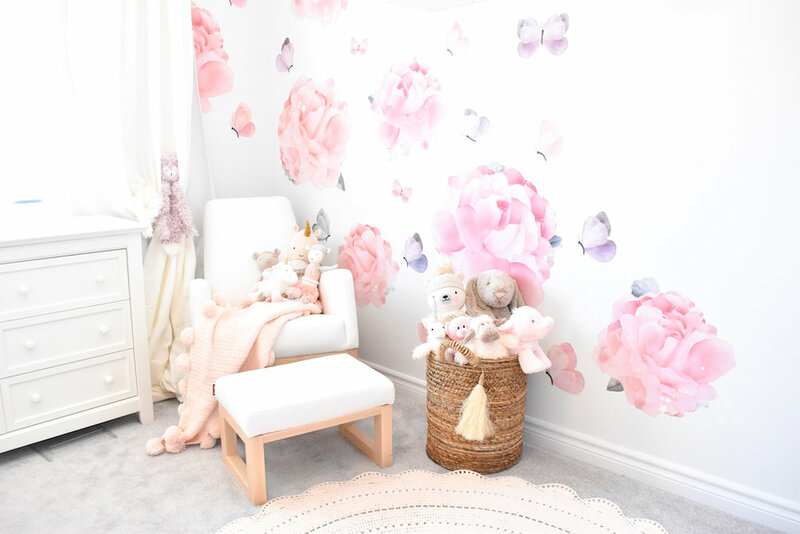 Her Peonies and Butterflies Wall Stickers were from Schmooksart. They were honestly SO EASY to put up. I think it took me about 30 minutes from start to finish. My husband and I did it together after I had put Melia to sleep, and it was really so simple. You just peal it off the paper, and stick it on to the wall. And whenever we made a mistake or wanted to reposition, it was just as easy to take off and re adjust, as it was to put it on the first time! I am so in love, and they have so many other designs! Don’t you love how these turned out? The magical prints that you see in the frames on her wall, are from Little Rae Prints. It doesn’t come with the frame though, so I ordered those from Amazon. The pink and wood play gym is from PoppySeed Play. Actually, this play gym is was first got Melia to start reaching out and use her hands back when she was three months old. She loves it so much! Even now! Although now she more or less crawls all over it and drags it around. But it’s still a form of learning and play! The Mobile thats over her crib, and the unicorn plush toy, is from buybuyBaby. Melia loves her Mobile, I remember the first time I played it for her! Does your baby like their mobile? Her adorable handmade toys are from Cuddle & Kind. What I love about them, is that for every doll sold, they feed 10 children! And they have so many beautiful handmade dolls to choose from! I got Charlotte the Dog, Ella the Unicorn, and Stella the Polar Bear! Aren’t they so cute? And last but not least, I got these super cute and cuddly toys that I had fun hanging around the room! They are called Slumberkins. They are sleepy animals so I thought it was cute to make it look like they are sleeping on the curtains like a hammock! What do you guys think? And that’s pretty much everything! 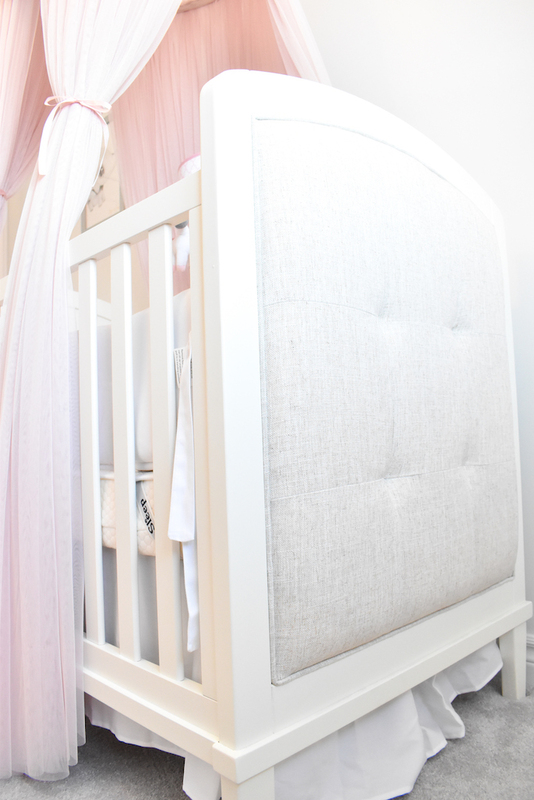 I had so much fun putting her Nursery together. I hope to inspire Melia to play, explore, and create every day. The development of a child is so important, especially the first seven years of their life. I am so aware of the impact everything I do and teach her makes on the character and person she will be. I really took all of that into consideration when putting together her little dreamland, and it brings me so much joy when I watch her play in there. 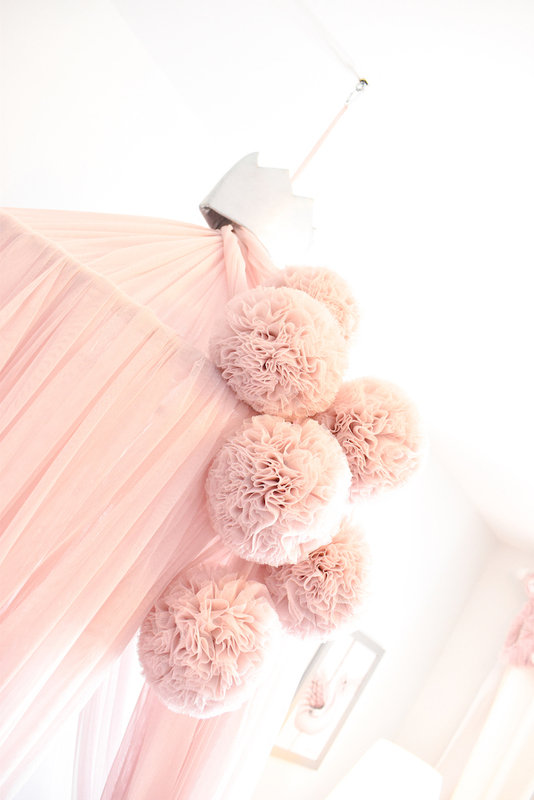 Hope this helped anyone who is looking for some Baby Girl Nursery ideas and inspiration. What kinds of things did you put in your nursery? Check out all of the brands listed above on Instagram! Shopping for Melia at BuyBuy Baby! This post was sponsored by buybuy BABY, but all opinions are my own. I had so much fun the other day at buybuy Baby shopping for so many new things for Melia! If you follow me on Instagram, you would have seen my Story, because I documented the whole thing! Melia is growing up soooo fast! It's amazing how quickly they change into new little versions of themselves. I feel like it was just yesterday I brought her home from the hospital, and with the blink of an eye, she’s now almost 4 months old! I remember when she only first started to really open her eyes and look around, and observe the world around her. Now she's not only making the cutest little sounds all day every day, but she’s kicking, reaching for things, putting everything in her mouth, smiling, and playing… it's amazing! She’s so aware! Every morning when she wakes up and it's like she has learnt something new in her sleep! All this to say… I HAD to go and buy her some new cute toys and clothes since she’s growing so fast and needs to stimulate her mind! Kelsey helped me out while I was there, and showed me around the store. I was able to ask her all my 101 questions I had about Melia, and a growing baby, and she not only recommended so many amazing sensory toys, but also helped me choose so many fun little outfits and other baby essentials that I never even realize I would need! The Munch Baby Mitt is a total life saver! She loves it! It's so cute, because right now she’s at a point where she puts everything in her mouth, so the mitts go right on her hand and make a crinkly sound which makes her soooo happy and excited! She loves it so much that I actually went back and bought her a second one, that way if one gets dirty, I have a back up! Same with the book and other toys I got her that have so many beautiful bright colours that grab her attention, and make sounds that gets her little curious mind working! I finally got her a mobile for her crib. Which you guys (on Instagram) helped me choose! I ended up getting the Just Born Dream Music Mobile in Pink/White. She isn't in her crib yet, but I am starting to get her used to her new room by putting her in her crib and playing the mobile while I do things like laundry or make the bed. She gets so happy when the mobile starts playing music and the little animals start spinning around, it's just so precious! I also got her the cuuutesssstttttt little Baby Girl Outfits! She’s wearing size 3-6 month, but I got her some sizes even bigger so she can use them for a longer time. Melia is pretty tall for her “age” (lol is 4 months considered an age? Adorable!) so I have to put her in bigger clothes if not they are too tight! Isn’t everything so cute??? I have a Boppy which stays upstairs in my bedroom for when I feed her before bed and at night - but whenever I am downstairs I always try to get comfy on the couch with pillows to feed and sometimes it becomes difficult, so I got a second Boppy® Luxe Pillow with Reversible Slipcover in Giraffe to make life a little easier! Also, it's great because when I go to my parents or out of the house, I can bring this one and not worry about forgetting it anywhere, because I know I at least have the original one in my room. And lastly, I got some cookies that help me make milk! They are called Milkmakers® 10-Count Chocolate Chip Lactation Cookies and they actually taste so good! The box comes in a pack of 10 bags, and you can have one bag a day to help you produce milk and help in lactation. Honestly thank you so much to everyone at buybuy BABY, especially Kelsey! She is amazing, and helped me out so much! Anyone who is in the Ottawa area should definitely check them out at the Train Yards location and ask for Kelsey. And even if you are not in Ottawa, they have a website online with everything! PS: Let me know if you guys have any questions about any of the products I got, I can totally help you pick out some cute things for your baby! Just send me a DM on Instagram! Feeling WONDERFUL on Christmas Morning!! This post was sponsored by WonderBra, but all opinions are my own. Girls! Take out your long fuzz socks, warm blankets and comfy pjs because Winter is finally here! Don’t get me wrong, I am a sucker for laying out hours in the sun, swimming in the pool, and driving around town with my windows down (cause I’m a cool mom! ), but for some reason I am really looking forward to this year’s Winter! I’m sure it has everything to do with the fact that it’s going to be Melia’s first Winter, and we are going to be able to celebrate Christmas and New Years together! My eyes are watering up just thinking about it, and my heart just exploded (joking not joking). So I have been getting everything ready for Christmas, and I still need to find a tree, and some cute pjs for us to wear (any suggestions? ), but I DO have the house partially decorated, gifts partially wrapped, and some comfy bras to wear because lets face it, Christmas just isn’t the same without feeling 100% comfortable, and wonderful… especially as a mom! Comfort is the utmost important for me, so I have recently stocked up on some of my favourite WonderBra bras, since they are not only cozy, but also provide flexibility, stretch, and beautiful designs to choose from! What better way to feel and look beautiful then with a WonderBra that has the best combination of quality, comfort, and fashion! I also love that they offer a selection of underwire & wirefree bras, plus size bras, and more. There’s so much to choose from! I am so excited to wear these for the holiday season, and forever to be honest! As a mom, I am always running around the house picking up socks, Kleenex, changing diapers, doing laundry, making food, changing more diapers, tidying up, making the bed, giving Melia a bath, (lol what DON’T we do?).. But this Christmas morning, I know that I will look and feel wonderful, wearing my beautiful and comfortable WonderBras! So if you are looking for the perfect bra, I highly recommend them. I wish I would have discovered them sooner! By the way, I’ll definitely be sharing photos of our Christmas celebrations on Instagram, so if you’d like to check them out follow me: @carlamariabruno and Melia: @meliazeineddine. This post was sponsored by CeraVe, but all opinions are my own. I have been on the hunt for the perfect baby products for Melia, especially since the cold and dry weather is coming up! Melia has been so good so far without any skin problems, but who knows what this winter will have in store for us! 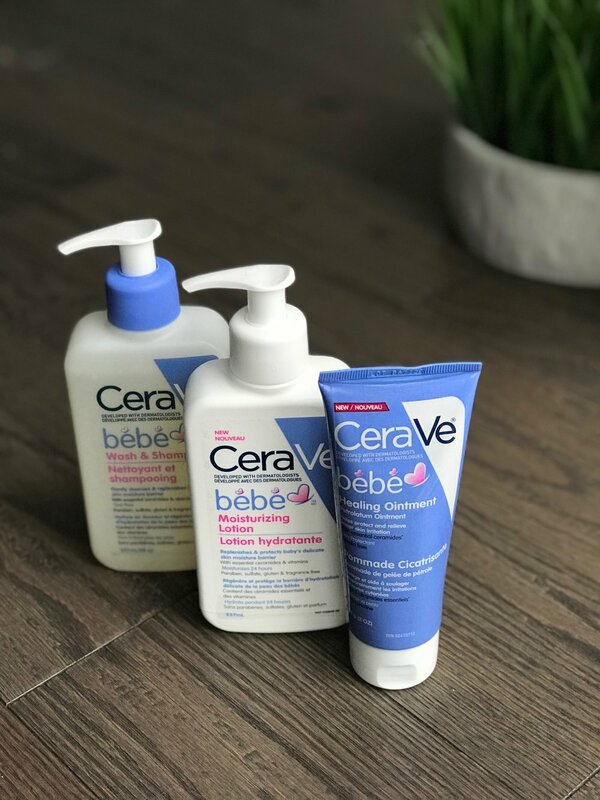 I have been reading a lot about CeraVe Baby Products, and after a lot of careful research I decided to purchase some - and I am SO HAPPY I did. I started with their Bebe Lotion, Wash & Shampoo, and Ointment, and I honestly love everything so far! I feel safe using their products on Melia, not only because the reviews speak so highly about them (especially for dry, oily, and eczema skin) but also because the ingredient list is not questionable at all. 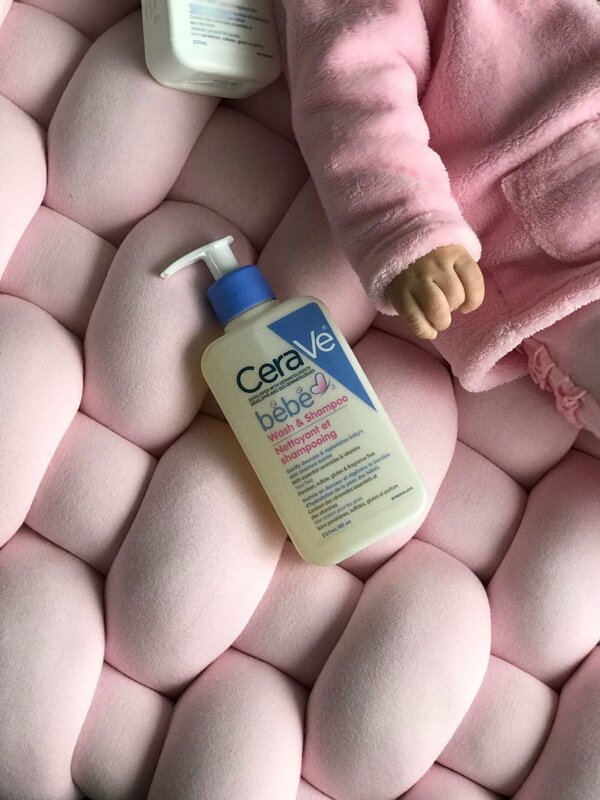 CeraVe Bebe does more then just clean and moisturize, as it’s made to protect and maintain our babies sensitive skin without any harsh ingredients. Actually, adults and kids can use it too - not just babies! I wash Melia’s bum with water after almost every diaper change, and when it’s really messy, I try to use some baby wash too. However, since I am washing so often, I had to find a body wash that would be safe and soft for her. The CeraVe Bebe Wash & Shampoo has been amazing for that. It is formulated with 3 essential ceramides and vitamins, which makes it so gentle and kind to her sensitive skin, that I have been able to use it as often as I’d like without being worried that her skin might get irritated. Their Baby Lotion works wonders as well! Our bedtime routine always starts with a nice gentle message for Melia to soothe her skin, and get her relaxed and ready for bed time. The CeraVe Bebe Lotion keeps her skin soft and hydrated without being greasy. It’s light, fragrance-free and very gentle. I also love to use it after her bath, as it helps to protect, replenish and maintain her delicate skin moisture barrier. It quickly absorbs into the skin, and leaves her feeling smooth and healthy. Now, the CeraVe Bebe Healing Ointment is my favourite product so far. I truly feel it needs to be in every store. It is AMAZING! I have been lucky with no diaper rash yet, nevertheless I have been reading so many reviews about how it works wonders when it comes to diaper rashes - so I am using it to help prevent them. After I wash her body or bum with water and CeraVe Bebe Wash & Shampoo, I use the ointment within minutes after drying her up, to really help protect her from dry skin and seal out wetness. It has a unique, lanolin free formula with a non-greasy feel, which I love! I am so happy I came across their line of baby products, and I know you will be too. I highly recommend them as they are affordable, gentle, and fragrance free! CeraVe Baby Products are super safe for our babies delicate skin, and thats why I always turn to them when it comes to using only the the best products for Melia. Ok, but seriously philosophical questions aside, I have been attempting to catch every single family moment (as you can probably tell from all the daily photos I post on my Instagram Account and her Instagram Account). I have been trying to film and take photos of everything when it comes to Melia. But honestly it’s not easy trying to capture high-quality REAL moments, without having to set up a whole day for “photoshoots”. So, I came across the MOVO Photo SmartCine Video Kit, and it’s a total game changer! I fell in love with it and I wanted to share it with you because I know you will love it too! I got myself one just now and let me tell you, it is the BEST! The Video Kit works with any smartphone, and it’s super easy to put together (I posted a photo and video on my Instagram if you want to check it out for more info). The Kit comes with two high quality lenses (one fish eye and one wide angle), an LED Ring Light (I know all the girls out there are going to LOVE that, makes for a flawless selfie! ), a professional microphone, a portable rig for easy movement, a security grip and so much more! They’re currently on Kickstarter, so go check them out and give them some support with a pledge! You can help back them and in return get a MOVO Photo SmartCine yourself! I have been having so much fun with mine, taking photos around the house and taking it out with me on the road, or to my parents house. It’s so easy to use that even they have been joining in on the fun and taking professional family photos and videos on a daily basis! Here are some selfie photos I took using the SmartCine with the Wide Angel and Fish Eyed Lenses! I am so happy, now I can capture all of life’s moments easily and in high-quality, thanks to the SmartCine! Abu Dhabi, My Second Home!